China online sourcing of bussiness news, offering updated global business opportunities & industry movements. 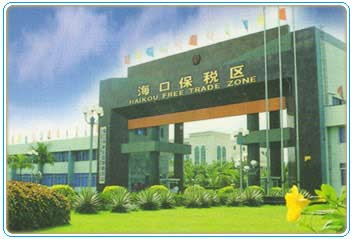 Haikou Free Trade Zone was established on Oct. 21, 1992 upon the approval of the State Council with an area of 1.93 km2. It was opened for formal operation on Apr. 13, 1993 upon the approval of the General Administration of Customs after examination. Jiang Zeming, former Secretary-general of CPC Central Committee, President of PRC and Chairman of Central Military Commission of PRC, and other heads of the state attended the opening and operation ceremony. From then on, the zone has shouldered the exploration into free trade zone development with Chinese characteristics and started its unusual journey. The zone is located in the south of the central area of Haikou City with charming tropical scenery, only 3 km from Hainan's busiest Xiuying Port, 18 km from Haikou Meilan international Airport, and 10 km from the approach of Yuehai Railway. It enjoys very convenient traffic where the Nanhai Avenue links up with the Eastern and Western Expressways and middle national highway. In the past 16 years, adhering to the principle that "development is of overriding importance", the zone made its interior construction scientifically, intellectively and ecologically with new and high technology as its leading industry to foster warehousing and logistics, and undertook function development according to the strategy of promoting peripheral economic growth with structural innovation, technical innovation and preferential policies, all of which had made satisfactory achievement. So far a Hi-Tech industry complex has been set up in the Area with biological pharmacy, automobile manufacturing, IT electronic information electronic machinery and processing as its mainstay. The Area has become a Hi-Tech industrial development base and demonstration plot of Hainan Province and efficiently fostered the peripheral economic growth. A professional concerns about China business and import & export. If you are interested in China and Global business or firendly links exchange, please contact me via Gtalk or e-mail.